This is a good book. I like the little white rabbit, he tries to get away from the black rabbit because he does not know he is his shadow. The black rabbit is good and scares away the wolf who chases the rabbit. I like the picture inside that shows where the white rabbit goes when he is trying to get away. The rest of the pictures are good, and it is funny when the wolf is looking up at the black rabbit. The Best bit: The map and when the white rabbit sits down in the woods to eat his carrot. I like this book. It has good illustrations that compliment the book. The story is funny and well written. 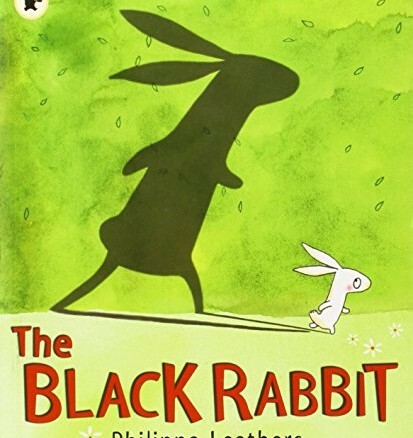 I do not think it is a scary book even though it is about a rabbit being chased because I think it is quite clear early on that the black rabbit is the white rabbits shadow. Overall we both like it and enjoy reading it at bedtime.